The woman in the silver Nissan Xterra, swathed in west coast urban adventurer garb, looks on gape-jawed as the bike slides up parallel. The bike moves forward slightly and the Xterra edges alongside again blocking traffic. Consideration for a bike in Vancouver? No, this is something else. The driver’s window whirs down and the woman, entranced, exclaims, “What is it? I’ve never seen anything like it! 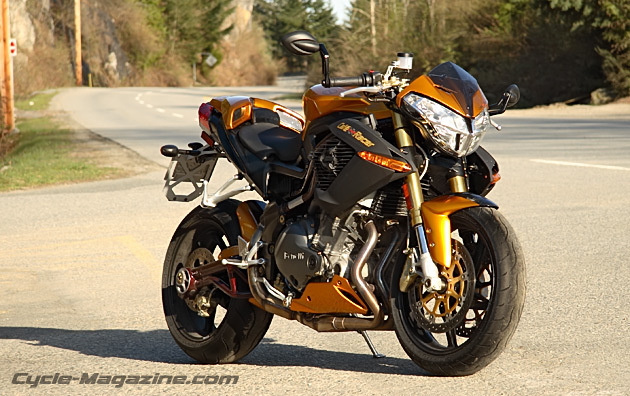 It’s gorgeous!” It is the Benelli TNT 1130 Café Racer, and riding one you should brace for such attentions. Mostly you’ll hear, “What is it?” Benelli’s being as rare in Canada as Spartans at the Battle of Thermopylae. Consult the oracles though and the TNT 1130 Café Racer is likely this Italian exotic manufacturer’s truest spear for piercing the North American market’s phalanx – if only based on looks alone. It’s as if the design team at Benelli sat down and said, “Italian design with all the curving lines and sexual innuendo needs freshening. Let’s do something different, truly foreign and aggressive.” So they hired a God of War, taught him pencils weren’t for stabbing, and chained him to a drafting table. Actually Brit Adrian Mortontroke penned the TNT’s original visual outrage, and the Café Racer just perpetuates the anger management issues. The headlight assembly is a gladiator’s face shield. The switchblade key doubles in length, letting you stab into the Benelli’s ignition above the tank’s Italian insignia chest-plate. The top’s a wasp. 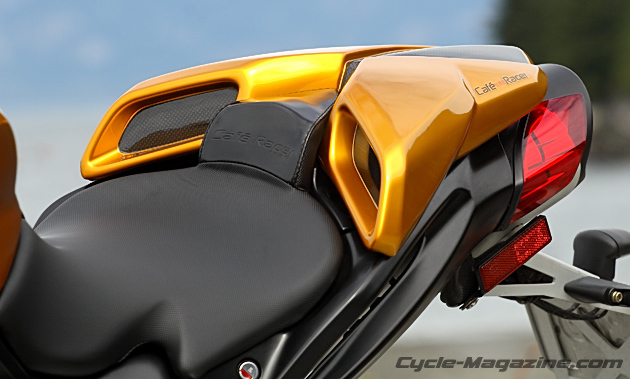 The brake-light is cleaved in two making way for a Termignoni sourced under-seat exhaust. The offset chain adjusters are concentric works of art. The maroon frame is a precise and cleanly welded sculpture. Every machined piece is adorned with additional detail befitting an exotic. Bar-end mirrors look the café racer part, and (gasp) work exceptionally well. Vented side panels house side-mounted radiators and look like they should break away revealing rocket launchers – unfortunately these black plastic covers are stitched together like scooter parts in the Keebler Elves’s first industrial manufacturing attempt. Beyond that it’s smooth muscular curves, gold, and armoured with lashings of carbon fibre. While other manufacturers have stuck with a derivative retro-recipe, Benelli has created what today’s (and possibly tomorrow’s) café racer should look like. 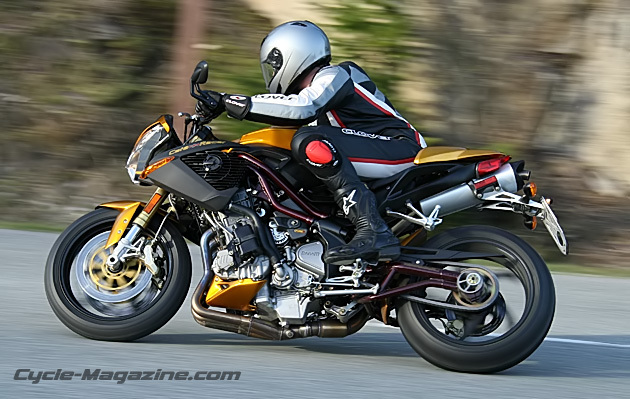 Next to the Café Racer, the Ducati Monster S4R is an elderly senator who just soiled his toga with fright. The K1200R is an over-plump ex-warrior retired to nobility, and other street fighters are frail babes fit for abandonment on Mt. Taygetos’s slopes. Astonishing as the Benelli is to look at, that’s nothing compared to riding it. Benelli’s 1130cc in-line triple sounds agricultural at idle, but remember Lamborghini once built still builds tractors [Thanks to reader Peter Laurence for pointing out my error – Ed.]. Fitting because from 3000RPM to redline any roll-on of the throttle delivers stump-pulling torque – to a maximum 86 ft-lbs at 6750 rpm. Making the front end light is ridiculously easy. Past 5000RPM the triple takes on a raw bellicose chordal note that from the seat invokes the aural assault of a hard-driven Italian Supercar. Helpless to this audio addiction, I find myself constantly and needlessly spinning up, spooling down, up and down shifting just for the soundtrack. The sound and power build to a maximum 135HP (claimed) at 9250RPM. The triple doesn’t spin-up as fast as an in-line four, but without any power-bands the throttle feels directly linked to the rear Dunlop. That’s enough to happily whip the TNT Café Racer to speeds, where a hurricane onslaught over the fly-screen attempts to force-feed you a helmet chin-bar. Luckily, Brembo-supplied braking will drag you back to sanity even quicker. Up front twin 320 mm discs clasped by 4-piston calipers offer a progressive and subtle action after a strong initial bite. 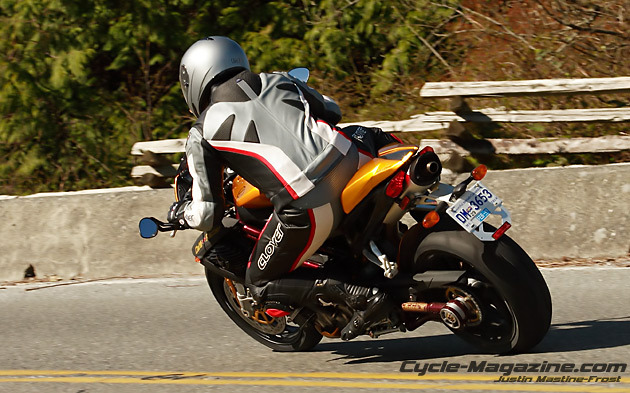 The 240mm rear disc with twin piston caliper is surprisingly strong for a sportbike and allows for aggressive braking distributing the force between the front and back Dunlop Sportmax tires. Should you feel like riding conservatively, in wet weather say, then press the Power Control button which radiates sinister intent on your license from the instrument cluster’s lower left. Perversely backwards, pressing the “bright red button” actually gentles the TNT, engaging an “economy mode” injection map. Gentle is relative; the engine develops a still athletic 112hp and 75 ft-lbs/102Nm of torque (claimed), enough for the Benelli to handily keep pace in local sport-rides. 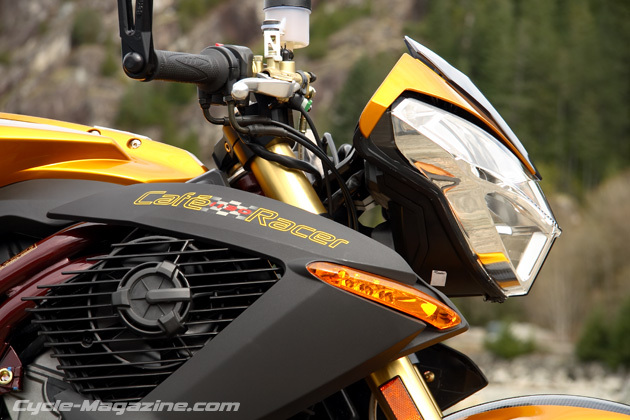 This low-key map also smoothes the snatchy below 4000RPM throttle response for effortless in town toodling, and offers enough off the line torque for throttle-less parking lot maneuvers. Excitement isn’t gone either, unlike air travel, Benelli’s vision of “economy” is still fun – sweep past 8000RPM and the TNT explodes with a final thrust to the to red line that attempts to rip your arms from your body… how sensible. Even on “economy mode” the Benelli is more “gas station” racer than “café” racer. A Weapon of Mass Consumption the 1130 guzzles premium octane in volumes only matched by Paris Hilton on a bender or mid-sized SUVs – reprehensible but a small price for the kinesthetic glee of hooligan throttle play. Given the seat’s Spartan padding you’ll be fine with topping up when the fuel light comes on, around 120km into the 16.5L (4.4 Gal) tank, and giving your aching buns a rest. Out on the twisties the Café Racer is benevolently easy to ride, taking corners on a magnetic rail; counter-steer, set the lean, and you can near let go of the bars while the bike executes the turn. Neutral in ways that titter at Newton’s laws, the Café Racer combines the Ducati 999’s planted stability with an exquisitely light tip in that belies its 199kg (428lb) claimed dry weight. 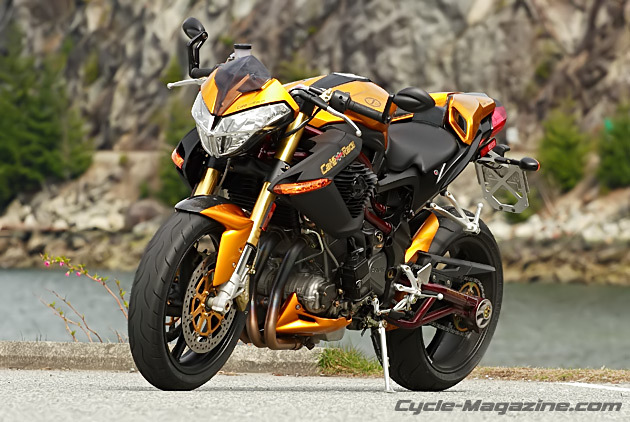 Precise as an epee’s point the TNT requires none of 999’s relationship building, and betrays no street-fighter flightiness the Monster S4Rs or KTM 990 Super Duke. The Café Racer hits an impeccable handling geometry sweet spot, which feels like the result of road rather than track development. On the Café Racer scrubbing speed into corners becomes optional, exiting with the front end light but controllable is mandatory. In a sportbike world that measures differences in milligrams and milliseconds the jump is huge. On a favourite tight turn, where earlier this year Honda’s excellent CBR600RR carried 90kph, the Benelli’s entry speed is good relaxed fun at 110-120kph. 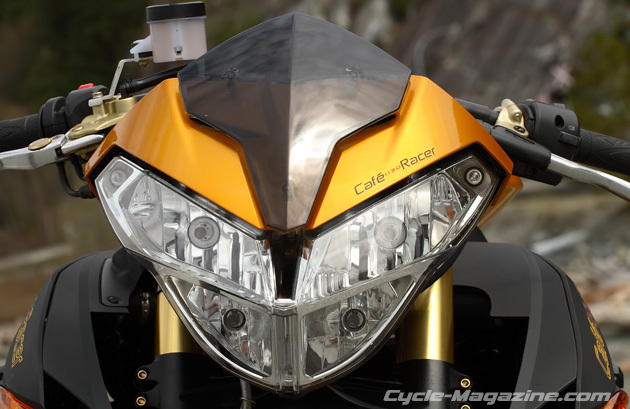 With practice the CBR600RR could surely be taken in hotter, but the TNT Café Racer delivers prowess, to the tune of one multiple of the posted, unrehearsed and with tire-edge to spare. Helping the Benelli’s handling cause are the firmly damped 43 mm Marzocchi forks, feeding you the road’s every bump, crease and ladybug. You may want to play with the damping, rebound and spring pre-load adjustments, but even on stock settings these are class defining. The rear suspension offers only preload adjustment, and the valving makes aggressive riding jostling on rough surfaces. The firm setup excels on smooth roads, yet is supple enough to navigate even the harshest construction zones with poise and confidence. As fluid as the handling is, the shifting isn’t. The six-speed cassette-style transmission is accurate but industrial. Smooth, precise and heavy at the lever, the cable actuated wet clutch sees you building a left-hand death grip riding in traffic. Your main calisthenic? Holding the clutch in at lights while hunting, and occasionally finding, the elusive neutral. Save yourself from being driven to distraction, shift to Neutral while still rolling to the stop. Conveniently, if confusingly, once the bike is running the start button controls and cycles between the odometer/trip meter, clock/trip and chrono/lap timer on the digital gauges in a combination of single and two-second presses. The electicals are… exotic. The Benelli folks suggest only turning off the bike using the key, that the kill switch be off overnight, and that the headlight flicking off when the fans kick in while at idle is a “power save” mode. They also recommend I trickle charged the Café Racer overnight due to battery issues, advice I completely ignored. The good news is the Benelli was fine – save once, where after hard riding the Café Racer needed to sit allowing the battery to cool for a few minutes before starting. In an era of enervating faultlessness such warnings differentiate the Benelli and every time it comes to life you feel like celebrating – not many bikes do that. Did I keep the TNT’s mileage “reasonable” over a week of testing? No, every attempt to walk by the Benelli in the underground saw me returning from a ride hours later. I apologize to Forza Crono , but how can you resist riding a bike that ignites envy and midlife crisis wherever it goes? Especially when comfortable upright ergonomics let you survey the chaos you’ve caused? Let alone that the TNT never begged for mercy ripping through the corners as if Cerberus were on its tail. Justified on prestige, the Benelli TNT 1130 Café Racer, at $23,995.00 CDN, could be placed on a moodily illuminated rotating pedestal in the living room in a fate without honour. Combining looks of sculpted muscular aggression that makes Gerard Butler look like a cream puff, with a potent engine ready to trebuchet your license into non-existence, and fluidly precise handling that makes you a cornering genius, the Benelli’s Café Racer trident is sharp enough to make the competition bleed. You might come to the Benelli TNT 1130 Café Racer expecting a delicate exotic, but what you get is a warrior that lusts for challenging roads and is an unapologetic hooligan. 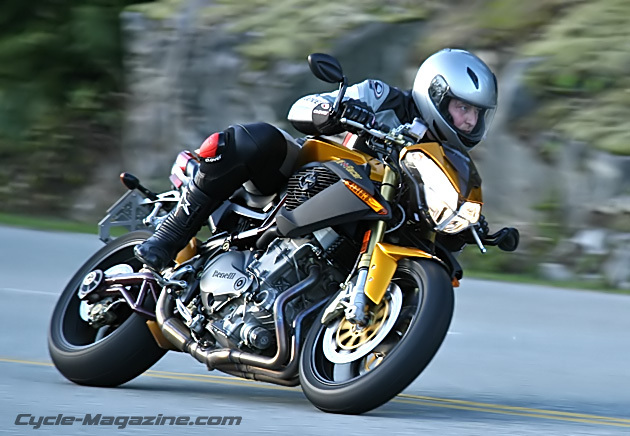 Special Thanks to Forza Crono for supplying our Benelli TNT 1130 Café Racer test bike. Swag Disclosure: Neil Johnston’s Clover Motorcycle Apparel provided by Crono Motorcraft, who are also Benelli’s Canadian distributor. Next Post Horsepower and Happiness – The Wrong Equation? I have been trying to track down a Cafe Racer since ’07 if someone knows of a good used or new one in the US send me an email.